Each installation by USA Paving is completed to the owner’s specifications. New driveways can be installed w/ belgium block or brick bordering as desired. Smaller driveways are built by hand to perfection, and large driveways, roads, and parking lots are installed w/ self-propelled paving machines. Several steps are required for a new construction. First the site to be paved is inspected to see if any problems such as drainage or setting may occur. Often cable or water companies will have to be called in to do “mark-outs” on the site. Often a survey may also have to be looked over to insure exact property lines. Next the site is excavated and all grass, concrete, old asphalt are removed and carted off the site. The sub base is graded and power compacted. Settling can take anywhere from a day to 2 months to be achieved. The site is finally paved with hot commercial asphalt at a depth of 2 to 3 inches, depending on the requirements of the job. 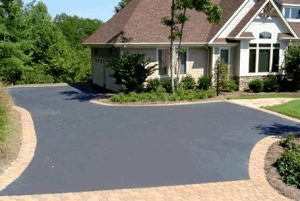 In many cases resurfacing an existing driveway with new blacktop is an option. . If it’s not broken up, asphalt is a strong base for a new layer and there is less chance of settling because you are not disturbing the ground. This will depend on the condition of the existing blacktop. If it is in decent shape, and the reveals on the border are not a problem factor, then resurfacing is recommended. Complete asphalt removal and replacement may become necessary if an asphalt pavement has not had regular maintenance. Often small cracks will form on the asphalt surface deepen over time. This allows water infiltration into the lower levels of asphalt that will freeze during the winter months. When water gets into these deep cracks, it can create holes in the substrate, structurally weakening the asphalt. These small surface cracks will also spread across the asphalt, then run deeper below those areas of the surface, so that large parts of the asphalt surface and their lower levels become affected. When this happens, superficial repairs are not sufficient to fix the structural damage. 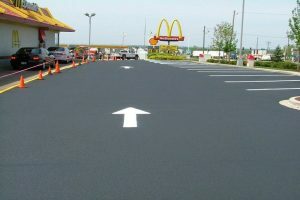 The asphalt must be removed and replaced. Thanks for stopping by! We're here to help, please don't hesitate to reach out.